It should go without saying: breakfast is the most important meal of the day. And if you do it right, it’s the only meal you need (at least until lunch). One of the essential functions of breakfast is to help us wake up. In the early morning, the prospect of a warm meal is often the only thing that can get us up and out of our sleeping bags. Having a solid breakfast also kick starts our metabolism, sets our body’s internal tempo, and lays the foundation for the rest of the day. That’s a pretty tall order for a packet of instant oatmeal. 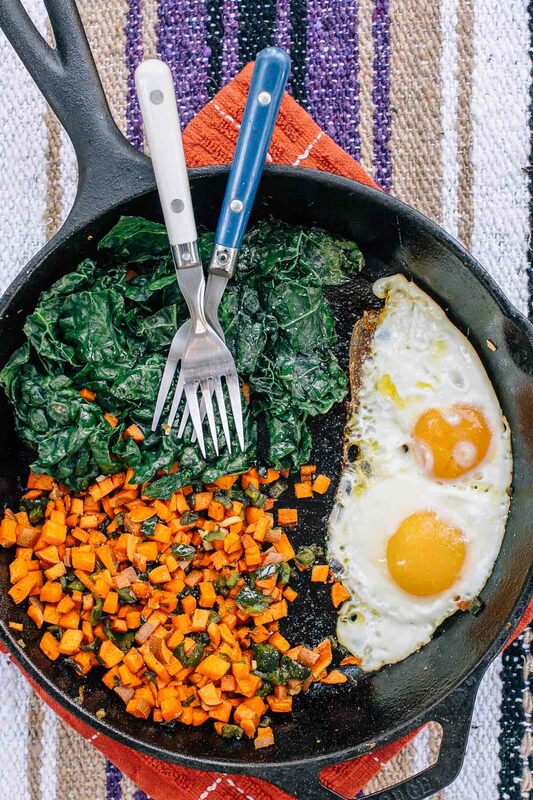 We’ve been longtime advocates of the breakfast skillet, both for its simplicity and dynamic range. 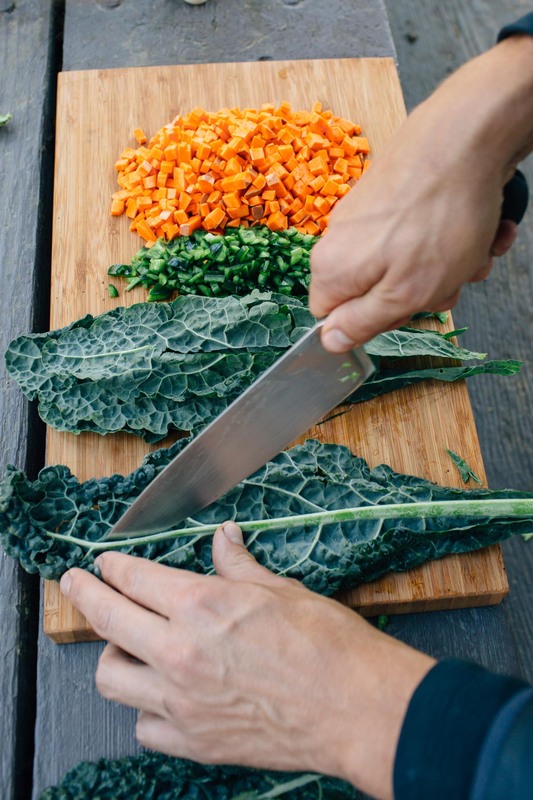 Add as little or as much as you want, mix and match flavors, and build a meal that inspires you. 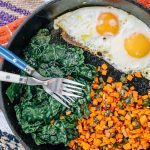 When it comes to flavors, this Sweet and Spicy Skillet is designed to have it all: something sweet (sweet potatoes), something spicy (poblanos peppers), something healthy (kale), and something hearty (eggs). Sprinkle with some salt and pepper and you’ll have a 360-degree flavor profile that will really light up your taste buds in the morning. Heat the olive oil in a skillet over medium high heat. 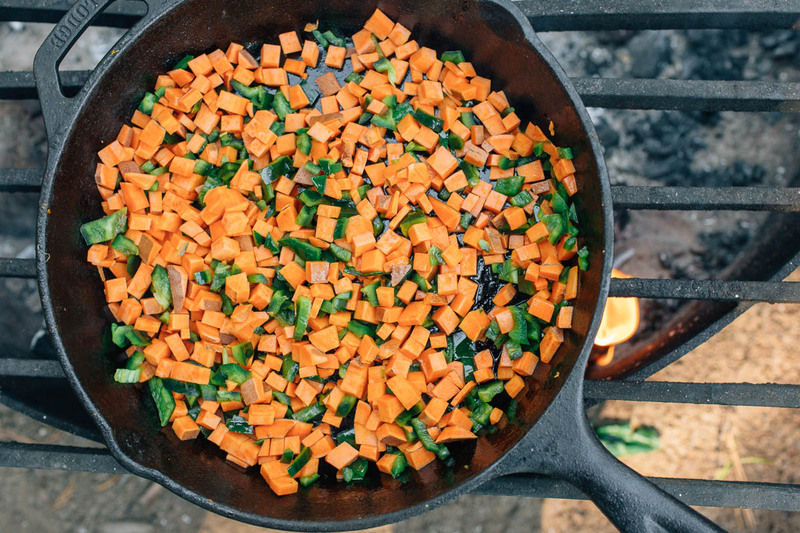 Once the oil begins shimmering, add the sweet potato, peppers, and 1/2 teaspoon salt. Cook 7-10 minutes, until beginning to soften, stirring occasionally so the vegetables cook evenly. Add the kale and garlic and cook an additional 3-5 minutes until the kale is tender. 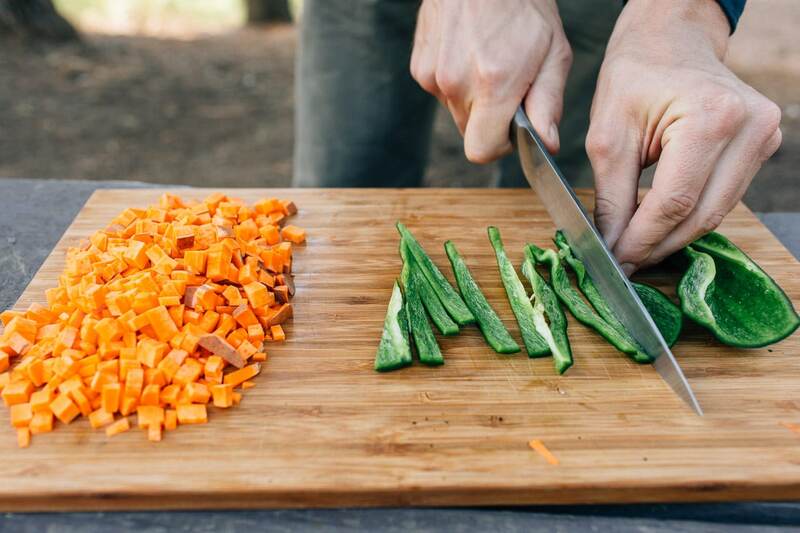 Once the veggies are done, move them off to one side of the skillet. Add more oil if needed, then crack the eggs into the empty half of the skillet. Cook until the eggs are to your liking; we like them fried but still runny in the middle. Split between two plates, season with salt and pepper, and enjoy! 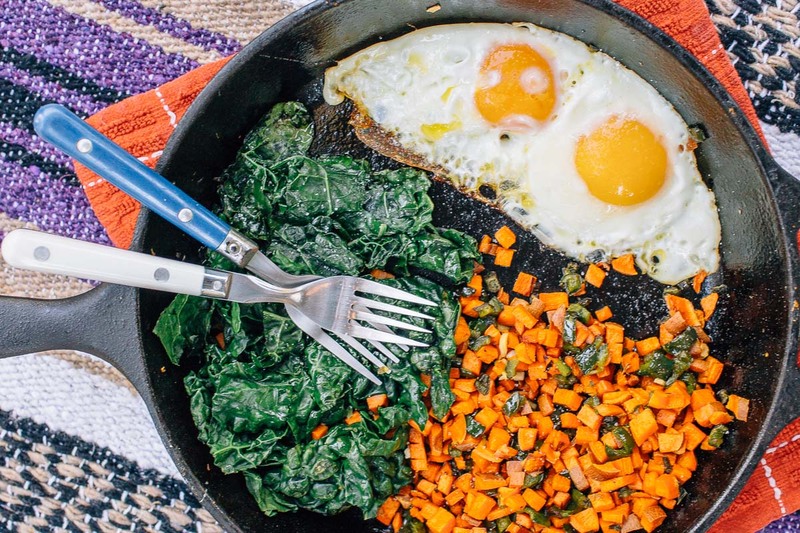 This breakfast skillet looks so delicious! 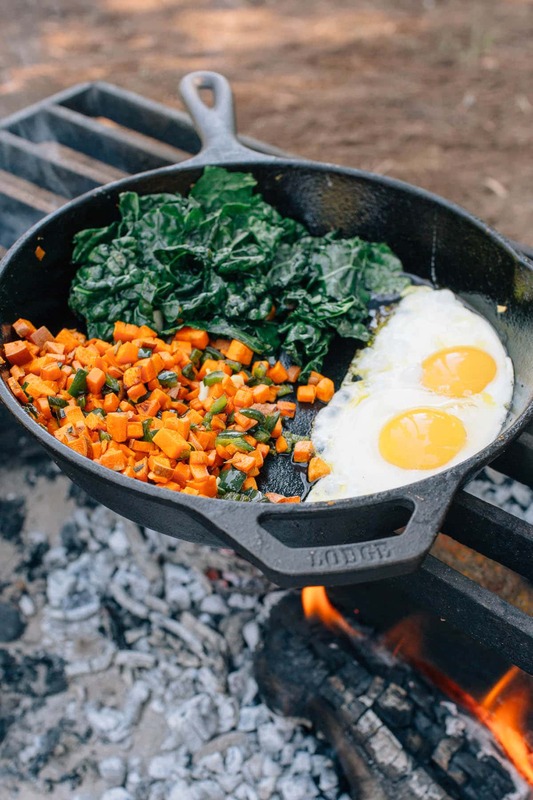 And you’ve truly kicked it up a notch cooking it in a cast iron over an open flame! Thanks for sharing your adventure with us! 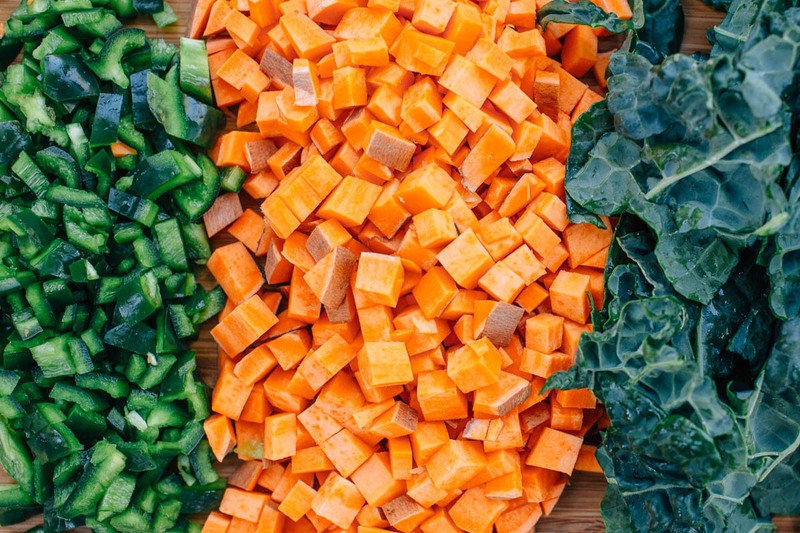 Love your photos – this looks delish! I so LOVE this. 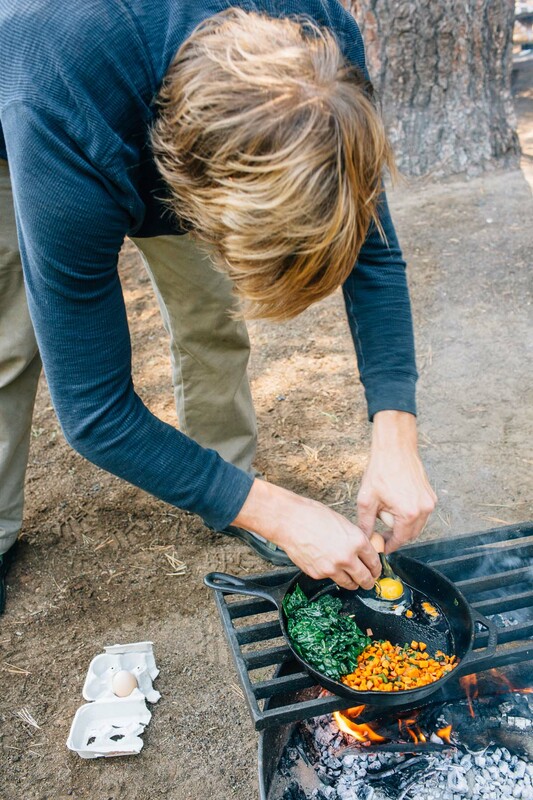 Heck yes to savory camp skillet breakfasts! 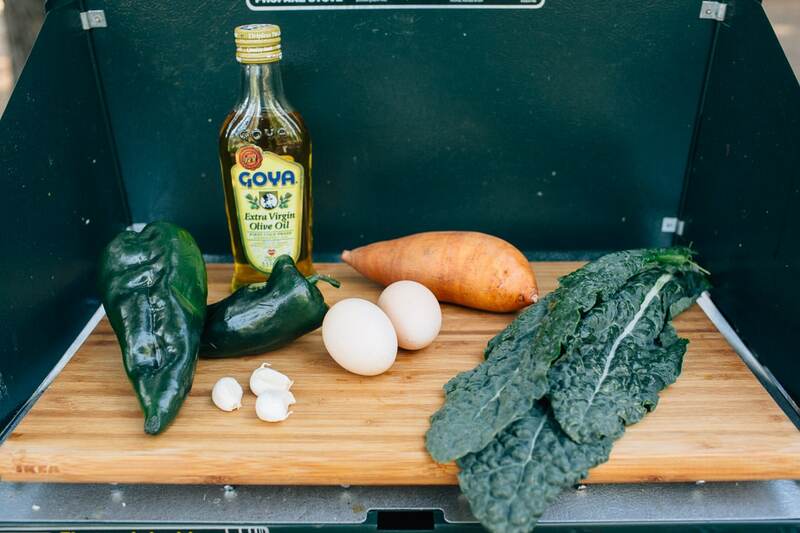 We are all about the savory breakfasts over here! !